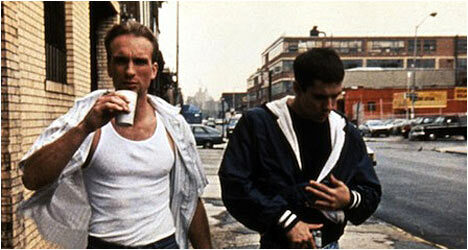 Written and directed by Nick Gomez, Laws of Gravity is a hard-hitting snapshot of a few days in the lives of petty crooks Jimmy (Peter Greene) and Johnny (Adam Trese), lumbering through the streets of Brooklyn, looking for their next score. Jimmy's the smarter of the two and acts the big brother to the not too bright, overly sensitive and insecure hothead, Johnny. Jimmy tolerates Johnny's immaturity and short temper more than anyone else. More than Johnny's wayward girlfriend, Celia (a great Arabella Field). More than Jimmy's wife, Denise (Edie Falco). And definitively more than the neighborhood tough guy, Sal (Saul Stein). Jimmy's got his own problems. He's a parolee trying to stay out of jail, but not out of trouble. He's in debt to Sal and Denise tries to keep him in check. But Jimmy has a good heart. He's loyal to a fault and wouldn't hurt a fly. And he's also too lazy to hold down a regular job and not ambitious enough to be a master criminal. Instead, he pals around with Johnny, selling stolen electronics to local business owners and shoplifting crap like underwear and pencils. A chance for a prize score arrives in the form of their buddy, Frankie (Paul Schulze), back in town from a layover in Florida with a trunk full of guns he's looking to unload. Frankie is no big dreamer, but he has a sense of urgency that the others lack. He crashes at Jimmy's place with the merchandise. Sal isn't pleased about Frankie's re-appearance and dissuades Jimmy from getting involved. Soon, everyone's on Jimmy's back to drop his friends after douche-bag Johnny slaps Celia around at a barbecue. But Jimmy's loyalty and protection always take over. With no serious takers for the guns, the crew gets a little out of sorts and tensions run from each to the other. Johnny is eventually arrested for a missed court date and Jimmy scrambles to make his bail. He decides to sell the firearms at a discount and spring his buddy. Frankie finds out and is on a mission to settle the score, roughing up the buyer and ultimately confronting Jimmy and Johnny outside the local watering hole, which ends badly for the latter. 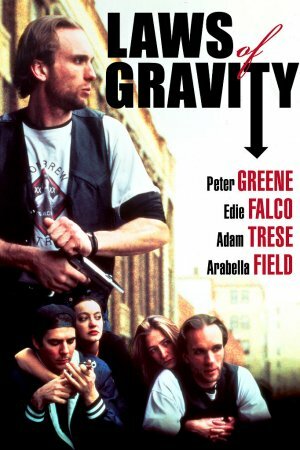 Laws of Gravity was released at a time when grit was making a comeback on the screen in low-budget, independent pictures. It's not as stylized as Reservoir Dogs (1992), or as atmospheric as One False Move (1992), but it's a worthy addition to the line of New York City crime films, using Brooklyn as an essential and beautiful backdrop, similar to Blast of Silence (1961). The film was shot in and around the Greenpoint and Williamsburg sections of Brooklyn, but this is not the Brooklyn that the new folks know. This is still the Brooklyn of rogue graffiti, abandoned buildings, body shops, car skeletons, and a brew of Italians, Irish, Jews, Latinos and Polish. This is the desperate Brooklyn before they tried to class it up with neighborhoods like Greenwood Heights, South Slope and Dumbo. The early '90s offered the final glimpses of this old borough. The changes came quick and wide after that. Good or bad is another debate. Gomez does phenomenal work with his grainy, no-budget film. He keeps the shots tight inside and level during exterior scenes. It's mostly handheld and standard tripod pans - and maybe some Steadicam, but that costs bucks and takes skill. It moves fast and you feel like you're hanging out right there with these people. Gomez shows you enough of the environment to understand that the lives of these characters play out as specks in a larger urban arena. Nobody on the outside really cares about what's going on. This indifference allows the guys to shoot off a couple of rounds on a roof, course through the streets with stolen loot and throw beer-fueled punches. And, whether by design or financial necessity, the impact of having Johnny shot off-screen in the final scene, while bystanders and friends watch in horror, is visceral and violently emotional. It's an uppercut to the chin of those who stopped caring about their neighborhood. It takes some getting used to the enormous amount of dialogue, including the old line and repeat line gimmick to create tension that would otherwise be done with more dynamic visuals, given a bigger budget. But the performances are so good that you get the feeling Gomez wrote the script with this cast already in hand. Greene was a prime choice for the lead. I've always admired his acting. Consistently excellent and underrated. He stands out, too. Not just because of his height and good looks. But because he has those defeated eyes and carries a sadness in his body that evokes the best of 1970s anti-heroes. You can feel his discomfort creeping in here. He goes from drifting like a summer breeze early in the movie to pacing like a storm cloud when his turn as a gunrunner bleeds dry. And his heartfelt screams when Johnny is killed echo the pain of failure of these characters.